Either if you are touring with your favourite mixing console and you want to use faders and knobs to remote control the 3D in-ear mixing on a KLANG device or if you are in the studio working with your favourite DAW – you have your individual workflow that works best for you. With the help of some tools MIDI to OSC conversion, OSC to OSC conversion and automation with OSC control of KLANG:fabrik and KLANG:vier become possible. In the following we will go through the setup steps. KLANG does not have any affiliation with the tools mentioned. These are just choosen as examples. If you want to know more about Open Sound Control (OSC) messages please take a look at the KLANG OSC reference documentation. 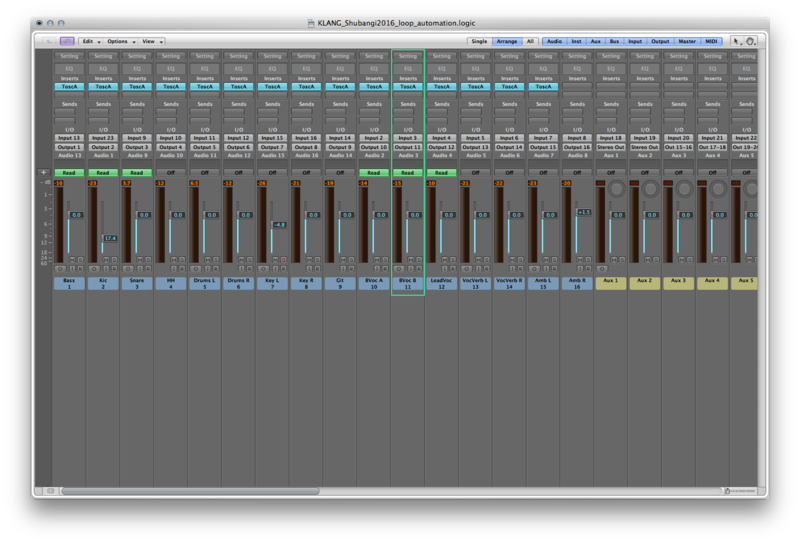 herefore be used with DAWs like Apple Logic, ProTools or Reaper. It enables the automation feature of the DAW to be used with external gear and apps. It transforms the internal automation data to basic OSC messages and lets you specify the OSC listening port and target port and IP address. It allows up to 32 parameters to be exchanged via OSC for alle audio channels. Download here. Detailed documenation on ToscA is found there as well. 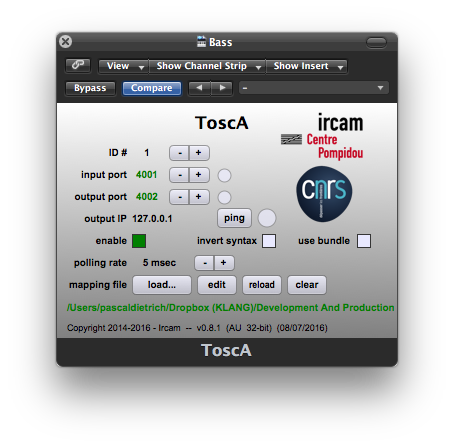 Here ToscA has been added to several channels in an Apple Logic project. Make sure that the index in Tosca matches the channel number. You only need to configure ToscA once. Go to any channel that you have added ToscA and open the plugin windows. If required created and load a configuration XML for parameter name mapping. Basic linear scaling of values can be achieved via XML preset as well. As an example a preset that maps and labels gain, azimuth and elevation angles can be downloaded here. 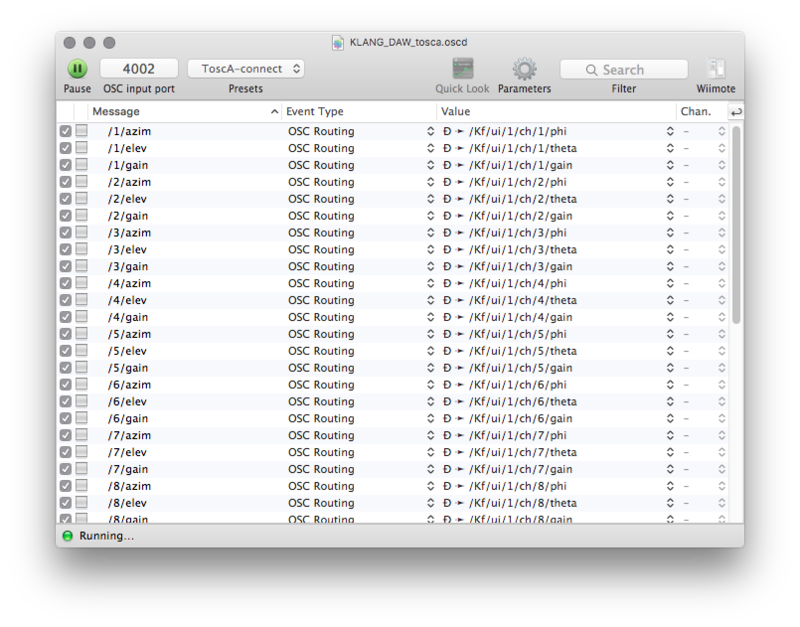 For OSC automation – especially in combination with OSCulator – we use localhost 127.0.0.1 as IP and send OSC messages to the same computer. We use the standard UDP ports 4001 and 4002. 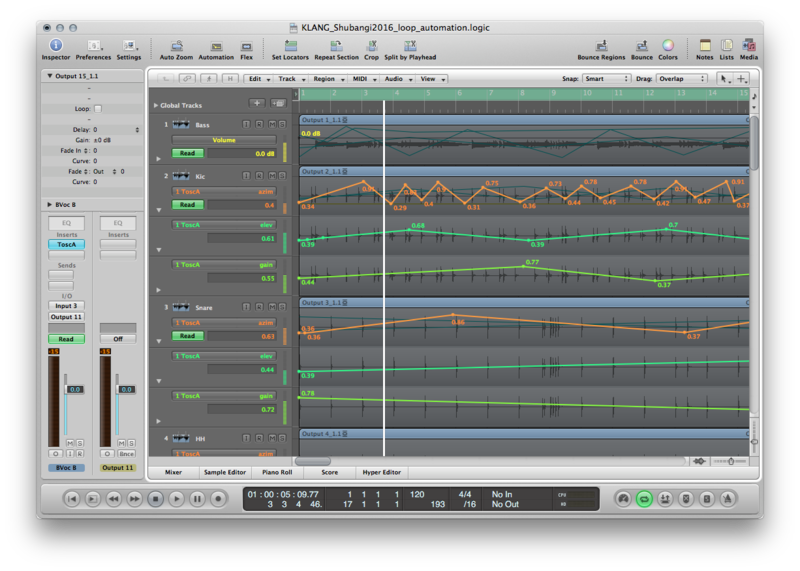 As an example automation tracks for gain, azim (azimuth), elev (elevation) are created in Logic in shown in the following screenshot. The DAW can now send automation data via OSC. 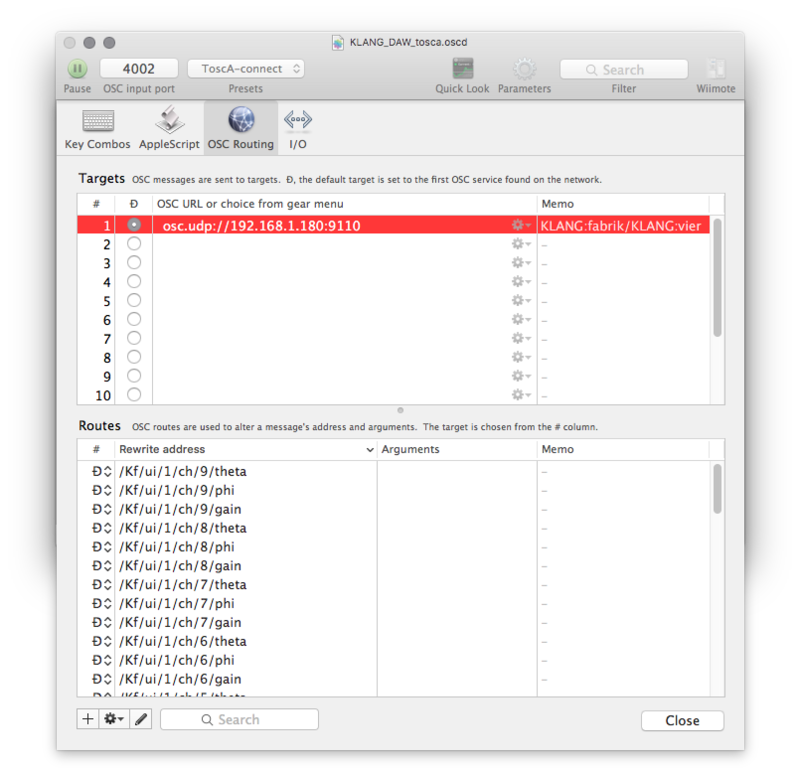 OSCulator is a commercial application for Mac OS X and can be downloaded and purchased here. It is a converter tool for MIDI and OSC and allows complex routings to and from MIDI and OSC. Hence, it is the perfect companion to translate OSC messages from various gear to connect the devices to a larger and more powerful combined setup. After starting OSCulator and loading this template file that routes incoming OSC commands from ToscA to KLANG:fabrik you have to specify the receive port, in this example OSC input port: 4002. In the template file azim, elev, and gain are mapped for the first 16 channels to phi, theta and gain for KLANG:fabrik / KLANG:vier. The following screenshot shows how it should look like. When commands are received yellow and green squares appear in front of the lines. Now you are ready to send automation commands from your DAW via OSCulator turned into commands for KLANG:fabrik / KLANG:vier. Thanks for reading. Please let us know what you want to read more about.